The Quaker Meeting House is centrally located at 1 Whiteheads Lane, which is just off Silver Street in Bradford on Avon, our postcode is BA15 1JU. For detailed directions and public transport information please scroll down this page. Download printable version of the map below (PDF, 1.5MB). Bradford on Avon is a regular stop for most trains running between Bristol/Bath and Westbury, served by 2-3 trains per hour in each direction during most of the week. For timetables and more information see the Great Western Railway website or the South Western Railway website. The Quaker Meeting House is a 5-10 minute walk from the rail station. To walk to the Meeting House, head straight out of the station up to the main road, which is St Margaret's Street. Turn left and follow the road over the Town Bridge. At the mini-roundabout immediately after the bridge, walk straight(ish) into Silver Street. Walk uphill and turn left at the Bunch of Grapes pub into Whiteheads Lane. The Meeting House is the on the left. Walk onto the car park where you will find the main entrance. Level access is to the right side of the building. Bradford on Avon is served by route number D1 (formerly known and locally still often referred to as 265) which runs between Bath and Salisbury (Monday-Saturday) and Bath to Trowbridge (Sunday, with some services going further to/from Warminster). The service runs every half hour on weekdays and Saturdays, and every hour on Sundays. Please check the First Group website for up to date timetables. The bus service in both directions stops at the Town Bridge; to walk from the stop to the Meeting House (3-5 minutes), cross the bridge over the river and follow the later stages of the walking directions as above. There is also a bus stop a little closer to Whiteheads Lane, where Silver Street goes over into Woolley Street. Follow National Cycle Route 4 along the Kennet & Avon Canal and the River Avon past the Tithe Barn. Continue along Pound Lane and turn left at the roundabout into Frome Road (joining National Cycle Route 254). Follow the road over the Town Bridge, then continue straight(ish) at the mini roundabout along Silver Street. The second on the left is Whiteheads Lane. Follow National Cycle Route 4 along the Kennet & Avon Canal until you reach the B3109 (Frome Road) near the lock. Turn right into Frome Road (joining National Cycle Route 254), then continue along the road over the Town Bridge. After crossing the bridge, continue straight(ish) at the mini roundabout along Silver Street. The second on the left is Whiteheads Lane. Follow National Cycle Route 254 which is mostly shared with car traffic and often hilly. You will enter Bradford on Avon on the B3109. At a roundabout with an old red phone box, you may, if your brakes are good enough, carry on straight down the narrowish lane called Whitehill and, towards the bottom of the lane, push your bike through a little alleyway on your right, then turn right into Whiteheads Lane. Alternatively, remain on National Cycle Route 254 by turning left at the roundabout into New Road and follow the road in a semi-circular way until you come to the Bunch of Grapes pub. Just before the pub, turn right into Whiteheads Lane. Follow National Cycle Route 254 until you see, shortly after crossing the Town Bridge, the sign 'Quaker Meeting House'. Turn left into Whiteheads Lane. Approaching the centre of town on the A363, when you reach Christ Church (with a tall spire) on your left, turn right down the hill down Market Street and proceed to the mini-roundabout at the bottom. Turn left and drive up Silver Street, then take the second on the left, at the Bunch of Grapes pub, into Whiteheads Lane. 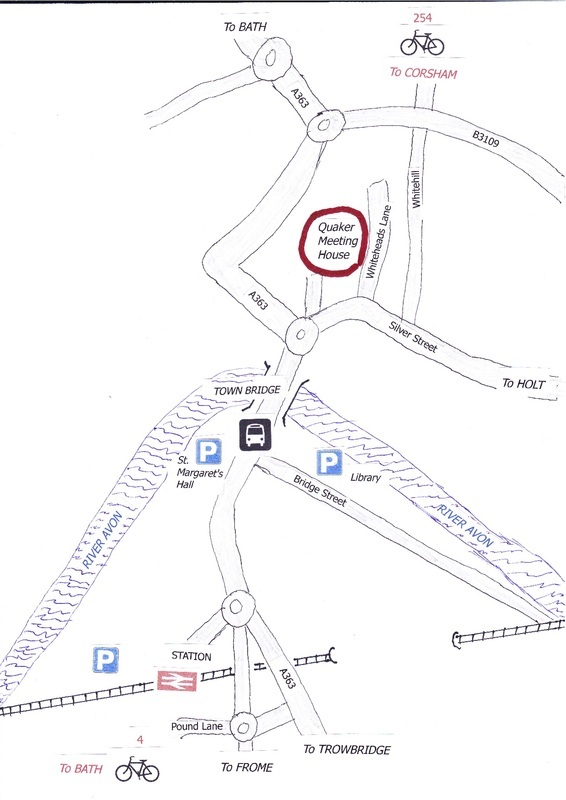 The Meeting House is on the left-hand side – look out for the small sign for our car park. Travel to Bradford on the A363/Trowbridge Road until the one way system takes you left along Junction Road. Turn right towards the town centre, cross the Town Bridge, and continue straight(ish) at the mini roundabout along Silver Street. Take the second on the left, at the Bunch of Grapes pub, into Whiteheads Lane. The Meeting House is on the left-hand side – look out for the small sign for our car park. Drive to Bradford passing the Moulton factory on the left-hand side. Turn right at the Bunch of Grapes pub (on your right) into Whiteheads Lane. There is also a black and white sign for the Quaker Meeting House at the bottom of the lane. The Meeting House is on the left.